Moonroof/Sunroof*, Heated Seats*, SUPER CHARGED, LEATHER SEATS*, Aluminum Wheels*, Bluetooth *, Cold Weather Package*, Premium Package*, Power Package*, Memory Package*, Sport Package*, Technology Package*, Premium Sound Package*, Wood Trim Package*, Cooled Seats*, CLS 55 AMG® V8 Kompressor, AMG® 5.4L V8 SMPI SOHC 24V Supercharged Intercooled, 5-Speed Automatic, Granite Gray Metallic, Charcoal w/AMG Nappa Leather Upholstery. 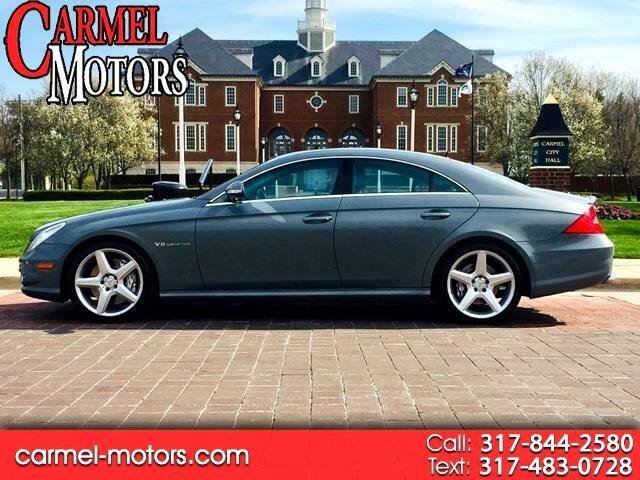 Granite Gray Metallic 2006 Mercedes-Benz CLS CLS 55 AMG® V8 Kompressor RWD 5-Speed Automatic AMG® 5.4L V8 SMPI SOHC 24V Supercharged Intercooled We Offer the Best Automotive Finance and Loans for Good and Bad Credit "GUARANTEED APPROVAL". Odometer is 52718 miles below market average! Let Carmel Motors show you how easy it is to buy a quality used car in Carmel. We can arrange shipping to anywhere in the country at our discounted rates. We believe fair prices, superior service, and treating customers right leads to satisfied repeat buyers. SERVING ALL SURROUNDING CITIES OF CARMEL, FISHERS, WESTFIELD, MCCORDSVILLE, FORTVILLE, NEW PALESTINE, NEW CASTLE, GREENFIELD, GREENWOOD, MUNCIE, YORKTOWN, MARION, GAS CITY, SPENCER, CICERO, KOKOMO, LAFAYETTE, COLUMBUS, NASHVILLE, BROWNSBURG, AVON, BLOOMINGTON, MARTINSVILLE, BEDFORD, JASPER, WASHINGTON, EVANSVILLE, VINCENNES, GARY, CROWN POINTE, SHELBYVILLE, MERRILLVILLE, CRAWFORDSVILLE, WEST LAFAYETTE, FT WAYNE, SOUTH BEND, ELKHART, HAMMOND, RICHMOND, CINCINNATI, LOUISVILLE, CHICAGO, NASHVILLE, TENNESSEE, EDINBURGH, TERRE HAUTE, SHERATON, MONTICELLO.